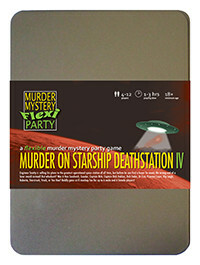 You've been invited to play the role of Princess Layer in Murder on Starship Deathstation IV. The infamous Engineer Snotty has just finished the plans for the greatest operational space station of all time, and now he’s invited all sorts of scum and villainy from the across the galaxy to bid for them. But before the auction can begin, Snotty is found in pieces, literally, on the wrong end of a laser-sword! Can you boldly go and find his killer before they strike back again?! PRINCESS LAYER is a royal princess and likes to loaf around in her royal flowing white robes with her hair delicately styled to resemble danish pastry. Everyone knows she’s hiding a laser gun in her garter (it shows through the robes) but it doesn’t stop her from packing protection. Princess Layer was born into royalty and spent most of her formative years in the lap of luxury. definitely push them up the hierarchy even if they had no intention of using them. I’m Princess Layer and you’ve all caused a massive diplomatic faux pas by keeping me here. Other than being regal, my hobbies include shaping my hair into pastries and commenting on the appearance of others. When the murder occurred I was in my quarters trying on evening wear. Besides, engine rooms are far too dirty for me to even consider stepping into. I was here to bid for those wretched plans to stop them falling into the wrong hands, and to dispose of a couple of droids that keep following me around.